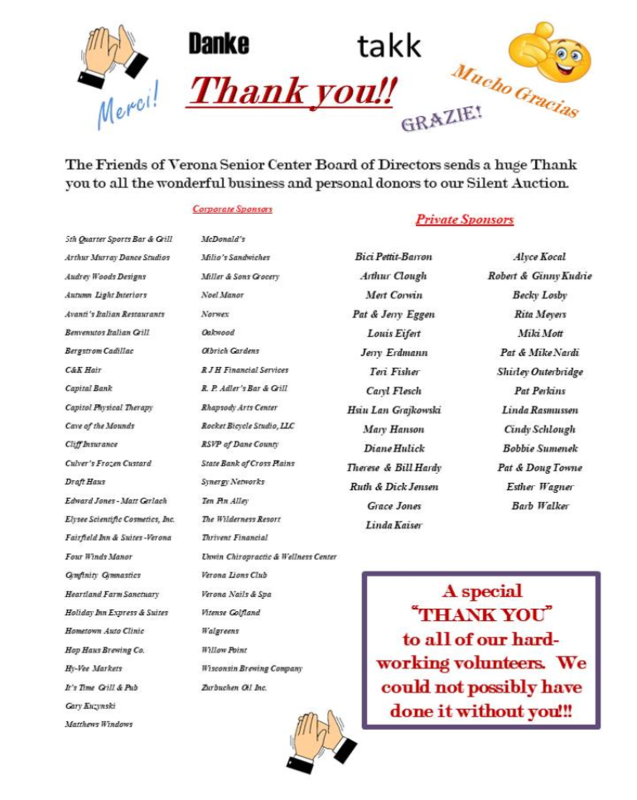 The Friends of Verona Senior Center Board of Directors sends a huge Thank your to all the wonderful businesses and personal donors to our Silent Auction. Click here for the PDF version. New and exciting experiences have come to the Senior Center. The much-anticipated Rendever Virtual Reality equipment has arrived, and with the Board’s generous monthly subscription, seniors now have the chance to visit places they once only dreamed about. We will be holding a MEGA Fundraiser in July this year and have many exciting ideas in mind. 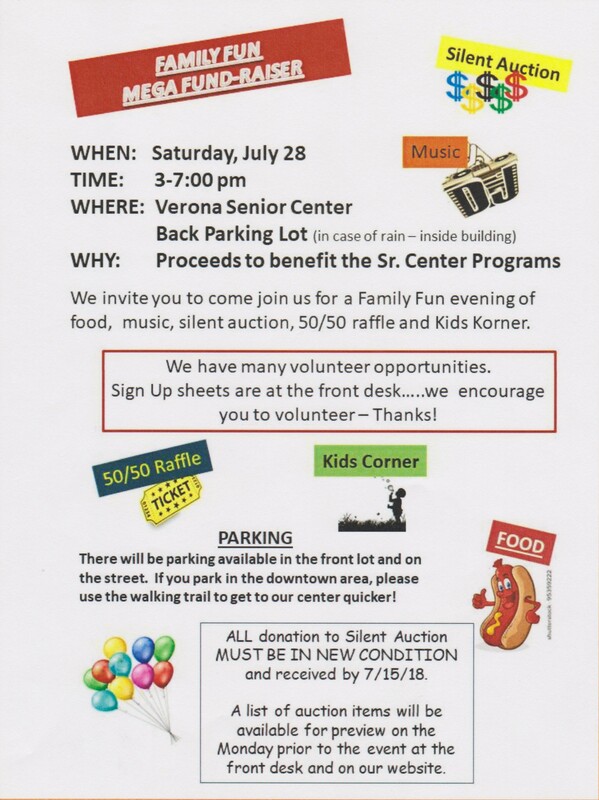 A “street dance”, brat sale, raffle, silent auction and “kid’s corner” are some of the things in the works. If you have anything you would like to donate for the silent auction, please bring those items to the front desk and fill in the donation form. ALL DONATIONS MUST BE IN NEW CONDITION. We hope all of you will join in the fun. The Board now has a box for donations, suggestions, comment on the counter near the check-in screen. Please share your comments and suggestions. We are always looking for new ideas and ways to improve your experience. Donations to the Friends Board are tax deductible. some of the special events held each year. 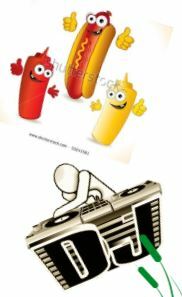 They are also used to help provide the music programs everyone enjoys. The Friends Board also maintains a Helping Hands Fund for emergencies. The success of the Senior Center is due in large part to all the volunteers that generously give their time. There are many opportunities available for anyone to join in, so please consider volunteering. 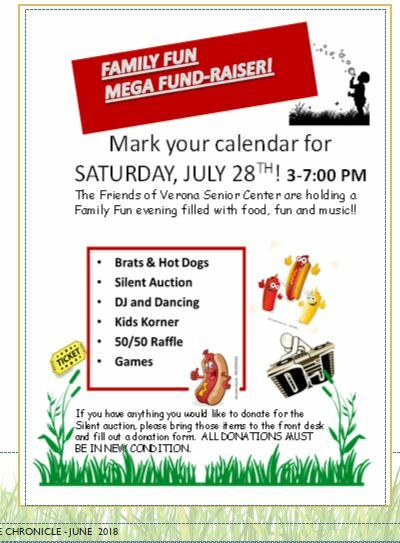 Mark the date for Saturday, July 28th to join in our Senior Center Family Fund day!